The Find: Boscanova is in Boscombe, near the seaside town of Bournemouth and boy is it doing good things for this part of town. Boscanova Cafe is cool and unique with bags of charm, energy and character. A great place to come to alone or with friends, to drop into or sit in for hours. It boasts a bright and fresh interior bursting with friendliness and personality. A book could be written on how great their food is and how delicious their cakes are - but let's cut to the chase here - the coffee. 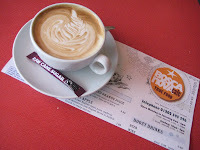 There is no doubt that this place offers the best coffee in Boscombe - if not in Bournemouth too. They take time and love over preparing each cup... and although the consistency has been a bit iffy in the past, they are certainly making tracks now. In April 2009, when we first reviewed Boscanova, their coffee supplier was far from ideal. Since this criticism, the owners of Boscanova have changed supplier to Has Bean - horrah! This means that coffee at this joint has just become 100 times sexier. On the wall they have coffee related quotes on canvas.... look above you and you'll notice the lights in here are made out of espresso cups and if you have a look near the till you'll find their tip jar is made out of a stove-top percolator - nice touches guys!